Omar El Akkad is the author of American War. He lives in Portland, Ore. The college town of Oxford, Miss., is home to one of the finest bookstores in America, Square Books. This May, its owners invited me to speak about my debut novel, about a fictional second American civil war. I wrote the book two years ago and never intended it to be about the United States in a literal way, but its publication in 2017 nonetheless coincided with the death of both irony and analogy in American public life. Over the course of a six-month book tour that will cover almost every region of this country, I find myself fielding questions not about any allegorical merit my book may have, but whether in writing a novel in which Americans take up arms against one another I was taking a stab at predicting the future. I come to peddle the fictional to a country whose reality has leapfrogged fiction. For the past four years, I have lived in America, but America does not belong to me. Here, I am part of a minority that constitutes the majority of the world: I am a person of colour. I am an immigrant in a country that purports to be a melting pot but is in reality a crucible, a vessel of fierce and fiercely luminous burning. To observe the United States from this vantage point is to observe a place simultaneously coming clean and coming undone. Any honest assessment of American life in this monstrous year must contend with a terrible unshackling of norms – a complete redefinition of which ideologies are worthy of public discourse – as well as the unsettling reality that none of this is new. This is a country that prizes its mythology above all else. But there is in its history ample proof that the United States tends to unleash its most self-destructive impulses immediately following – and in direct response to – those moments in which it seeks most boldly to achieve its stated ideals of freedom and equality. Such was the case with the racist incarceration and segregation policies implemented in the decades after the abolition of slavery, and with the gun-hoarding and white rage that followed the passage of the Civil Rights Act of 1964. Now, with the rise of Donald Trump and the transformation of the Republican Party into an entity so spineless and callous as to accept such a man as its standard-bearer, there is evidence of another terrible milestone in the history of American rage. I travelled thousands of miles across the United States this year, bearing witness to this strange hour of hatred and weaponized idiocy, the birth of Mr. Trump's America. 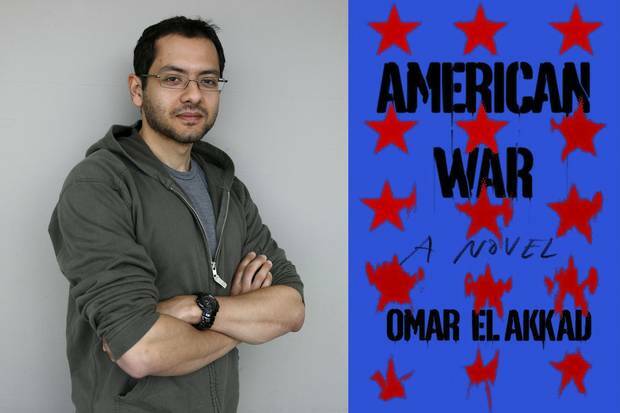 Omar El Akkad’s novel American War tells the story of a global crisis in the early 22nd century that has torn the United States apart. It made The Globe and Mail’s list of the best books of 2017. Read Lawrence Hill’s review of American War here. The city's newest tourist attraction is a thorn in the side of Midtown Manhattan. The traffic, already a nightmare, must now contend with White House Northeast, the towering outpost where the President conducts business the way a tribal leader holds court. 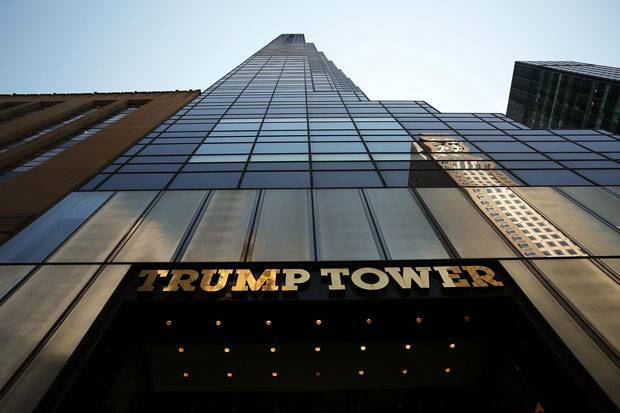 In those dizzying first days after the election, a deferential parade of business leaders, foreign dignitaries and tabloid-fodder celebrities come to Trump Tower to pay their respects, shake hands, maybe have a photo taken with the man himself. Outside, a different America responds a very different way. With endless enthusiasm, locals and tourists take turns posing for photos in which they give the building the finger – a ritual that has become as popular as those photos of tourists in Italy holding up the Leaning Tower of Pisa. Someone walks around with a sign that says, "Free Melania." So much of what lives at the core of the world's most powerful man is insecurity – and so much of that insecurity started right here in Midtown. 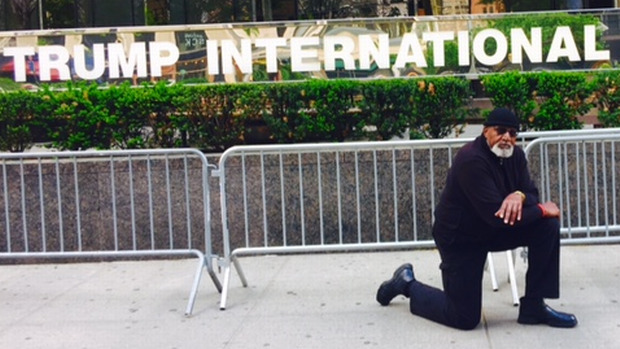 Born gagging on silverware, Mr. Trump nevertheless came to Manhattan with baggage from the less-moneyed boroughs. His father's real estate empire was born across the bridge, in Brooklyn and Queens, and the earliest among his son's long list of perceived slights was the certainty that New York's old money wouldn't have him. 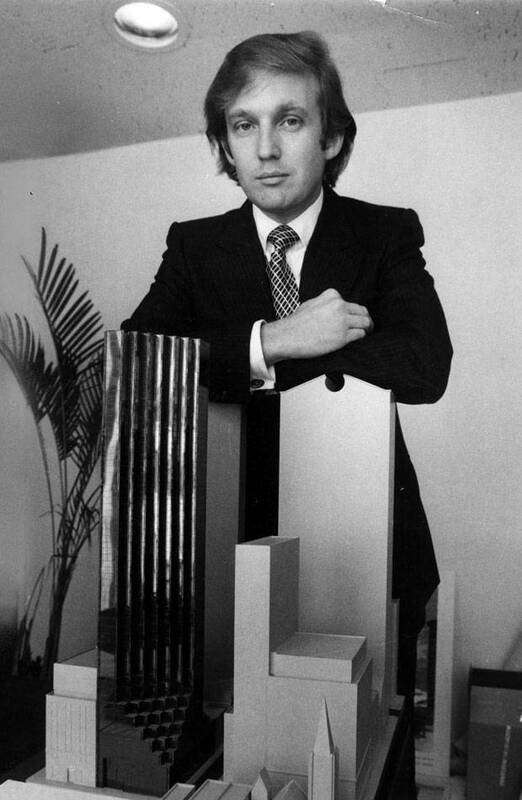 The real estate empire whose centrepiece now stands a few blocks off Central Park is the fruit of one of the very first times Donald Trump looked in someone's direction and thought: "I'll show them." Two incidents – one rooted in cowardice, the other in insecurity – cemented Mr. Trump's candidacy. The first came during Barack Obama's run for president in 2008 and lasted almost the entirety of his first term. It centred on the lie that he was born in Kenya – which would have made him ineligible to run. The conspiracy theory, thin as air, stoked by Mr. Trump and motivated by racism, marked a moment of truth for the Republican Party, whose fringe supporters made up the bulk of the lie's proponents. But instead of speaking out against an obviously racist slander, a host of Republican leaders demurred – unwilling to risk the wrath of potential supporters. From this moment, there could be no turning back. The GOP, having decided to acquiesce to its most extremist cohort, set itself up to be hijacked by any candidate willing to yell, rather than whisper, what that cohort wanted to hear. But there was a second incident, a smaller moment of unguarded emotion. It came during the 2011 White House Correspondents' Dinner. Mr. Trump is in the audience. Mr. Obama is on the stage. A few days earlier, the state of Hawaii had released Mr. Obama's long-form birth certificate, putting a symbolic end to a symbolic scandal. As Mr. Trump looks on, a frozen grimace/smile on his face, Mr. Obama runs through a litany of jokes about the issue, more than a few of which come at Mr. Trump's expense. For the most part, Mr. Trump withstands the ribbing, albeit without an inkling of grace. But there is one line that causes him to instinctively scratch his face, to wince – one line that really stings. It's when Mr. Obama sarcastically acknowledges Mr. Trump's "credentials and breadth of experience." For an instant, Mr. Trump nods – as though believing the compliment to be sincere. Then he hears the crowd laughing. "I'll show them," he must have thought. They come for Robert E. Lee last. 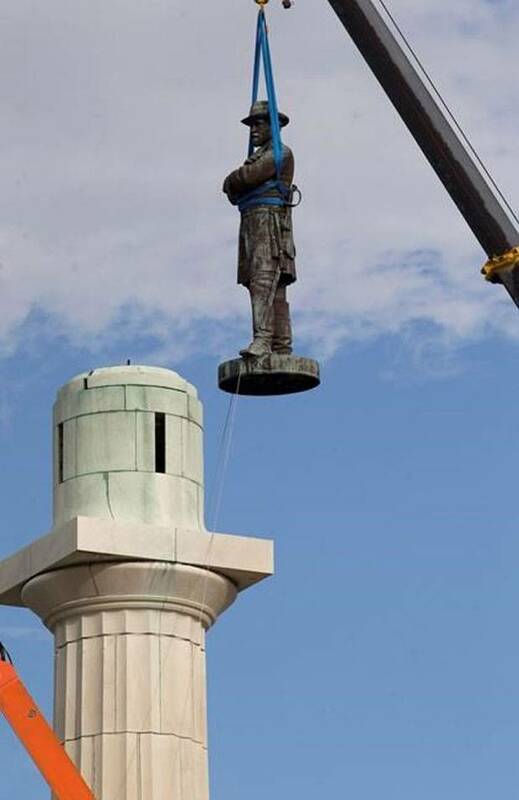 His weathered bronze figure, mounted atop a 60-foot-high pedestal, is the last of four Confederate statues to come down. The contractors charged with dismantling the monuments have so far done their work under the cover of night – there have been protests, death threats. But when it comes time to excise this memorial to the Confederate general, they do it in the light of day. It is, in the grand scheme of things, a terribly minor gesture. The removal of a statue commemorating a man who fought for slavery – who waged and lost one of the bloodiest wars in modern history – should not in a rational universe be contentious. And yet the backlash is instantaneous and fierce. A parade of conservative politicians, the President among them, condemn the removal of Confederate statues as an erasure of U.S. history. Protests are held, lawsuits are filed, men bearing assault rifles gather by the courthouse steps complaining that the country they know and love is changing, becoming unrecognizable. 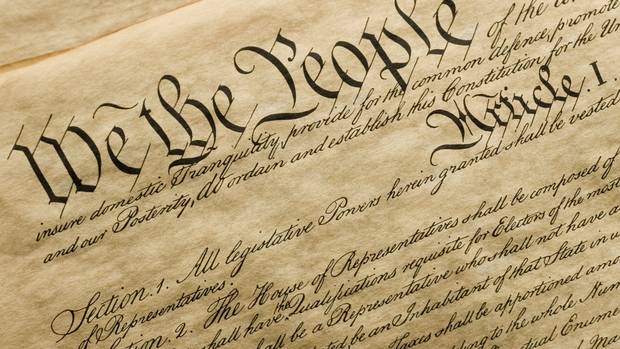 The history of the United States hinges on the worth of a mission statement both laudable and demonstrably untrue: that here, all men are created equal. The statement requires of its believer a kind of blindness to the fact that the modern United States achieved its geographic and economic expansion on the wages of genocide and slavery and that the echoes of this history are not only still resonant but central. Where America has succeeded, sometimes in world-changing ways, that success has always come as a result of slow, painful work – often conducted by men and women who paid with their lives – to acknowledge these facts and, in doing so, make the country's mission statement a little less mythical. It is perhaps for this reason that many of the worst sins in modern U.S. history have come in the aftermath of moments when the country sought to leap, rather than crawl, toward a better version of itself – toward making all men equal. So much of the wrathful reaction to the abolition of slavery can be seen in the roots of the incarceration and segregation systems in the decades after the American Civil War – systems that still scar the country's prisons, schools and suburbs. A hundred years later, the birth of the civil-rights movement brought another attempt at a leap forward – and an equally aggressive response. The 1960s and '70s represent, essentially, the end of Democratic Party hopes in much of the South. Those decades saw the transformation of the Second Amendment from a relatively benign artifact of early American law to the object of quasi-religious fetishization. Modern gun culture in the United States – as defined by the supra-legislative power of arms manufacturers, the hoarding of guns and ammunition and a pace of carnage that now approaches, on average, one mass shooting every day – traces its roots not to muskets and fear of British invasion but a far more recent and insidious fear: that minorities may turn around and do to white America what white America once did to them. Half a century later, the election of Mr. Trump represents in its own way yet another great step backward, another moment where one segment of America seeks equality at a pace that another segment deems egregious. 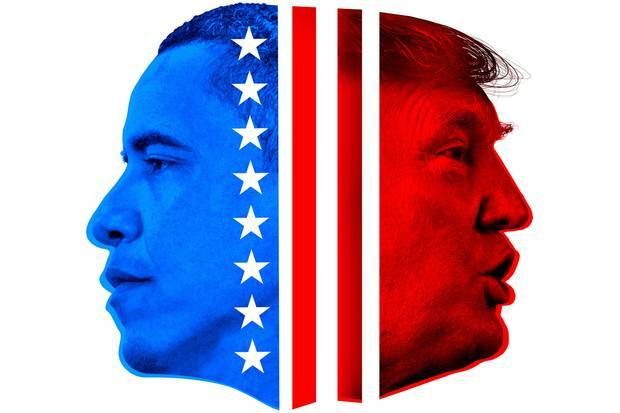 Both the candidate's motivation and that of his supporters are shaped by the undeniable sense of an America changing too fast and in the wrong direction – the latest point of evidence for this claim being the election of the country's first black president. There is, quite simply, no other honest way of explaining everything the Republican Party has done or allowed its President to do this year. Almost exclusively, the Trump administration's agenda has focused on rolling back protections for those Americans whose well-being determines whether all men really are created equal. The list is long and by now well-known: a series of racist travel bans aimed at keeping Muslims out; the prohibition of transgender troops in the military; an indiscriminate attack on the lives of immigrants; a directive to law-enforcement agencies not to focus on white supremacist terror. Rarely has a president been so single-minded, so consistent – without exception, every measure undertaken by the Trump administration has been designed to hurt more people than it helps. Like all previous moments of national wrath, this one will have repercussions long after the people who spearheaded the backlash are gone. The renormalizing of open white supremacism will resonate in hate crime statistics for years to come. The cadre of malicious and unqualified people chosen to run various public offices will in turn hire malicious and unqualified underlings, forever changing the culture of those offices for the worse. Politicians who come of age during the Trump era will see all of this not as something extreme or anomalous but as perfectly normal, an ideological starting point. But what is perhaps more surprising than the callousness with which the far right has embraced this ruinous agenda is the utter failure of mainstream American liberalism to do anything about it. Aug. 12: White nationalists exchange insults with counter-protesters as they attempt to guard the entrance to Emancipation Park during the ‘Unite the Right’ rally in Charlottesville, Va. Mr. Trump initially blamed ‘many sides’ for the deadly violence in Charlottesville, and was widely criticized for saying there was ‘blame on both sides’ in the confrontation. At the conclusion of a literary festival in this picturesque town bordered by mountains, I find myself in the basement of a local club, sharing drinks with some of the volunteers and attendees. Boulder is, overwhelmingly, blue – the city and the adjoining region voted for Hillary Clinton in the past election, even as much of rural Colorado voted for Mr. Trump. Among the people in this club tonight is a small cross-section of mainstream American liberalism. There are several boundary lines used to explain the divide between left and right in America (the dichotomy itself is flawed, given that the institutional representative of the left in U.S. politics, the Democratic Party, would in most other Western countries be deemed a centre-right party at best). The most simplistic of these models pits the liberal coasts against the country's big red middle. A more nuanced approach splits the rural from the urban. But even this model fails, in part because the diversity that honest progressivism demands is dependent on exposure – people living in proximity to those who have different backgrounds, different stories to tell. And there are plenty of cities in the United States that, like 88-per cent-white Boulder, have no such diversity. The result in cities such as these is a kind of myopic progressivism that sees the Trump era as a temporary aberration, a lapse. On this night, several means of correcting this lapse are proposed, chief among them the initiation of impeachment proceedings against Mr. Trump. There is a kind of desperate appeal to this line of thinking, a feeling that this must be the way to fix things, because the alternative – to address the centuries-long, systemic inequities in American society that led to this moment – is so much more daunting, requires so much more work. Impeachment is a radical step that imposes extreme stresses on the political system – and a high price on all sides. Here's a primer from David Shribman on how it could work. The liberal case for impeachment, for a quick and extraordinary end to the Trump era, also ignores the reality that the President may well represent the most grotesque face of the Republican Party but not the most insidious. Were he to be removed from power tomorrow, he would be replaced by Mike Pence, an anti-abortion, anti-immigration, anti-LGBTQ conservative who supported the Iraq War – positions broadly in line with the GOP worldview. The notion that Mr. Trump is an abscess on an otherwise morally salvageable Republican body is a fiction, designed primarily to camouflage the discomforting reality that, when it comes to everything from decimating the social safety net to waging perpetual war, the President hinders with buffoonery what his party would otherwise undertake with unfaltering resolve. In the long run, demographics are not on the Republican Party's side (non-white people voted en masse against Mr. Trump, although their warnings were largely ignored by most of the white electorate), and the GOP's path to power has become increasingly reliant on gerrymandering, voter suppression and the unique insanities of the electoral-college system. But perhaps more alarmingly, it is now difficult, if not impossible, for Republican lawmakers throughout the country to get elected without pandering to the extremist fringe that grew out of the Tea Party movement. 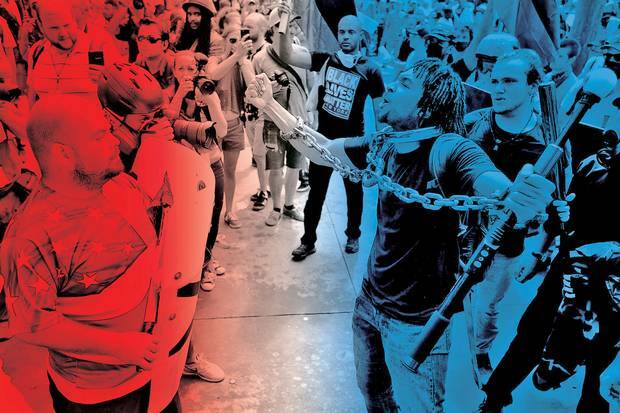 How this fringe came to take hold of the party and the presidency is a story about racism, misogyny and years of pent-up rage – but also of how the Democratic Party and its supporters failed to foresee, counter or contend with these forces. There exists a particular kind of American liberal who praises books such as Between the World and Me and films such as Get Out – both by African-Americans – with such enthusiasm that it borders on dutifulness, as though there is only one kind of response, cheer-leading, by which one validates the legitimacy of one's progressive credentials. This year saw a peculiar transformation of that same impulse, this time directed not at the country's most marginalized populations but its most hateful. What mainstream American liberalism once showered on its minority communities in the form of hollow praise, it now showers on its most hateful fringes in the form of hollow understanding. The year of Mr. Trump's election marks the re-emergence of terms such as "economic anxiety" and "white nationalism" to explain away far darker impulses – the rise of the beleaguered coal miner as justification for all kinds of legislative violence. Major newspapers across the country have devoted far more ink profiling the dapper Nazi next door than the myriad minorities that Nazi would happily exterminate, all in the name of heightened understanding. That angry, torch-wielding men feel comfortable conducting new-age Klan rallies in America in 2017 is chiefly the product of a right-wing conservatism that coddled and abetted white supremacism. But in the rebirth of open, uncoded racism in this country's public discourse, there is also evidence that mainstream American liberalism has never been particularly liberal – rather, just a comfortable insularity lacquered with niceness. One of the most infuriating things about living in America this year was watching countless well-meaning liberals point at the logical conclusion of centuries of systemic discrimination and say: "This is not us." In reality, the rise of the country's 45th President is exemplary of the most honest version of the American dream: a man who, by virtue of the colour of his skin and the magnitude of his wealth – and absolutely no other qualification – transformed his utter contempt for all rules of nominally decent behaviour into a limitless personal empire. The story of Donald Trump is a uniquely American story. In Boulder, we spend hours talking about impeachment. The people in the room are convinced it's just around the corner, just a matter of time. 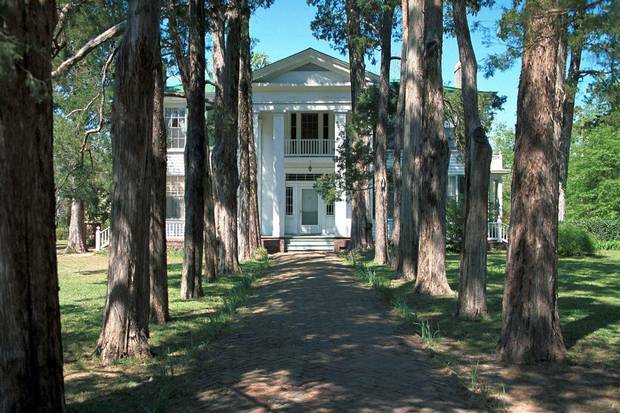 Rowan Oak, an estate in Oxford, Miss., built in the 1840s, was the home of Nobel Prize-winning author William Faulkner from 1930 to his death in 1962. He is buried in a hillside cemetery in the town. William Faulkner is buried here, in a sprawling hillside cemetery just down the street from the Confederate soldier memorial that marks the centre of town. His grave is a pilgrimage site of sorts, lined with liquor bottles left in reverence by those who come to see the man whose literary life mined the chasm between what this part of the country is and what it believes itself to be. Down the way, in a far-less-frequented corner of Oxford Memorial Cemetery, there lies another grave. Plain by comparison, it marks the resting place of Caroline Barr – the woman Faulkner called "Mammy," the woman who raised him. Born into slavery, she lived a hundred years and inspired some of the most memorable characters in American literature. Her grave is adorned only with a white marble square that reads, "Her white children bless her." Whatever it may think of itself, America has always been a place foremost of allegiances, most of them imposed. Almost everything that took place in American life this year – the entire catalogue of outrages and debasements – has happened before in one guise or another. And even though it is rarely discussed these days, the volume of the present being so deafening, history suggests this is not the last time America will move in the direction of its better self too quickly for its less-better self to bear. It will happen again, perhaps a few decades from now, perhaps when a new administration attempts to pay reparations or implement honest acknowledgment and sovereignty for those Indigenous people on whose land this country stands. And just as with abolition, civil rights and the election of the first black president, the reactionary wrath will come and its consequences will be felt for generations. It is sadly apt that the 2017 news cycle should end with twin stories of moral bankruptcy – one personal, one institutional. As the year comes to a close, a man accused of molesting children may win a Senate seat, beneficiary of an electorate for whom tribalism supersedes decency. Simultaneously, in Washington, Republican lawmakers fight to pass a 500-page tax bill into law, with deliberate haste, knowing full well it guts health-care benefits, robs the poor, devastates higher education and balloons the deficit – all to provide the wealthiest strata of American life with massive tax cuts. There is a kind of symmetry to these closing chapters, a conclusive victory for manufactured chaos. The defining thesis of American politics in 2017 must conclude the only thing that matters is that one's own flag is the last one flying, even if all it flies over is rubble. 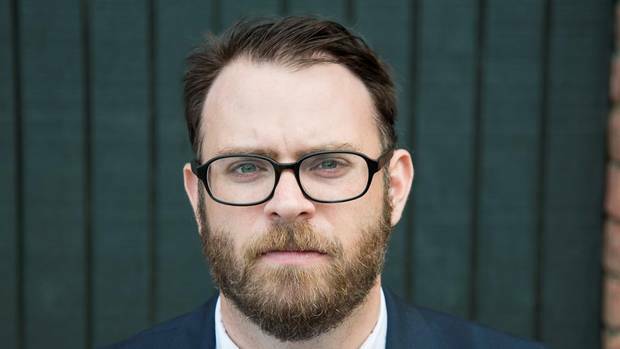 Jared Yates Sexton: He’s not a President. He’s a personification of America’s ills This is where we are now: Donald Trump, along with his major political party, are defending an alleged sexual predator lest it lose its stranglehold on the levers of power. Harry Edwards: As a pioneer of political protest in sport, I know Trump has fuelled the fire The President’s persistent and unrelenting attacks on African-Americans in sports give credibility and credence – if not validity – to the accusations that he is a white supremacist. 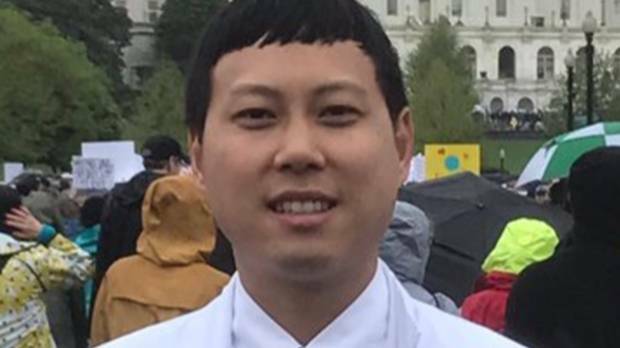 Eugene Gu: Not all Nazis wear armbands. We have to be vigilant against normalizing evil I was attacked by a white supremacist – not unlike the one profiled recently by The New York Times – on my way to work. I’ll never forget what the officer said: He looks normal.